The trophy was stolen on Sept. 29, police said in a statement. Police are still searching for the Tour de France trophy after it was stolen from a cycling convention in Birmingham nearly two weeks ago. The trophy was stolen from the National Exhibition Centre between 6:30 p.m. and 7:30 p.m. on Sept. 29, West Midlands Police said in a statement. Authorities are now asking anyone with information about the theft to come forward. (Tim de Waele/Getty Images) Geraint Thomas of Great Britain and Team Sky during the 105th Tour de France 2018, Stage 21 a mile 72 stage from Houilles to Paris Champs-Elysees, July 29, 2018, in Paris. 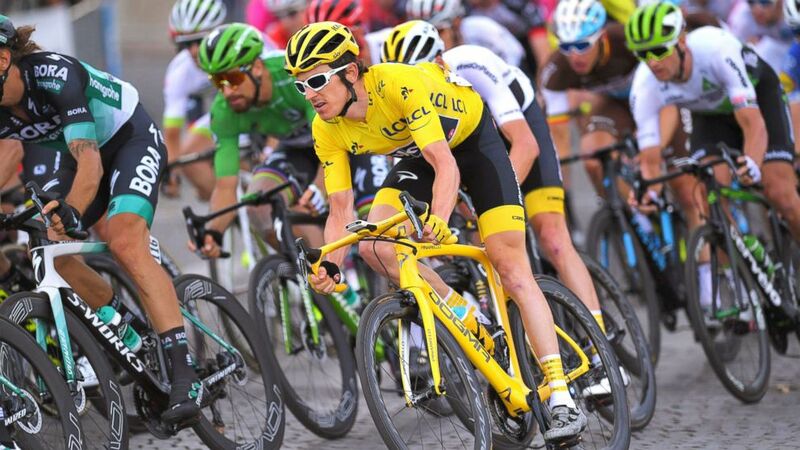 The Coupe Omnisports trophy was awarded to Geraint Thomas, the Welsh cyclist who won the Tour de France on July 29. Thomas, a member of the cycling outfit Team Sky, described the theft as "incredibly unfortunate" in a press release. "It goes without saying that the trophy is of pretty limited value to whoever took it, but means a lot to me and to the team," Thomas said in the press release. "Hopefully, whoever took it will have the good grace to return it. A trophy is important, but clearly what matters most are the amazing memories from this incredible summer –- and no one can ever take those away." The Coupe Omnisports trophy was on display alongside the Vuelta de Espana and Giro d’Italia trophies, which had been awarded to Thomas' teammate, Chris Froome. Only the Coupe Omnisports trophy was stolen. Team Sky had loaned the trophies to bicycle manufacturers Pinarello so that fans across the U.K. could have the chance to see it. 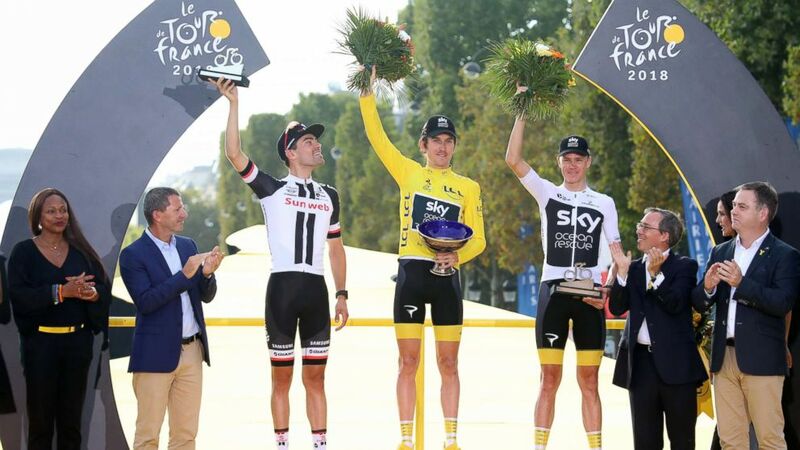 Team Sky officials said that while organizers were clearing up after the Cycle Show on Sept. 29, Thomas' trophy "was momentarily left unattended and stolen." (Mustafa Yalcin/Anadolu Agency/Getty Images) Winner Geraint Thomas (C) of Great Britain, Second Placed Tom Dumoulin (L) of The Netherlands and third placed Chris Froome (R) of Great Britain celebrate on the podium of the Tour de France in Paris, July 29, 2018. Richard Hemington, Pinarello's managing director, apologized to Thomas on behalf of the company. "We are obviously devastated about this," Hemington said in a statement. "We accept full responsibility and have personally apologized to Geraint. Obviously we all hope that the trophy can be recovered."